This is adorably cute Sue, love it! I like the patterns you've made, very creative. What a cute owl. Love the pen and ink version. I love drawing and Fixer Upper too. I would love to put your beautiful owl on the front of a white t-shirt. Hope that doesn't offend you. It's beautiful. That owl is adorable. It was just what I needed this morning, something to make me smile through my tears. Super owl. Isn't it amazing how doodles can keep us busy for hours. Have a great day. How fun! Sounds like a class I would enjoy too, and I like watching those fixer upper shows too. Your owl turned out great! nice, I like how you did the feathers. Patterns are very neat. Now that I see your owl, I am amazed that more of us did not do owls. Most people love owls. Yours is charming. I love birds and am madly in love with your cool owl! It rocks! 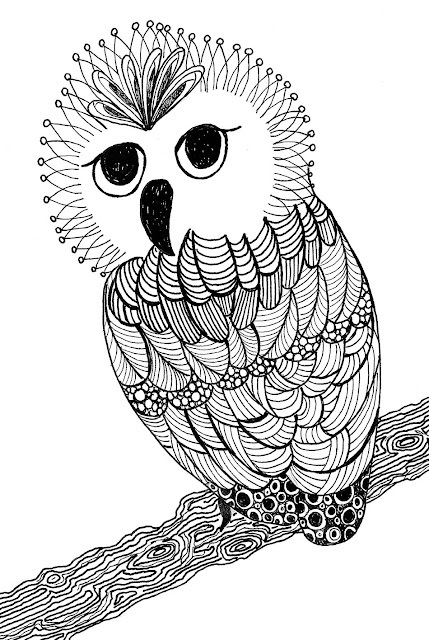 Your lovely owl makes me think of Zentangles...so effective and very meditative. Great take for this week's Picnic theme, Sue! Pen and ink and Fixer Upper...sounds like a winning combination! Nice owl!